The Protectobot medic is next in line. A very well designed retool and repaint of the Stunticon Off Road. First Aid is a very strong addition to the Protectobot ranks. First Aid’s vehicle is a hybrid ambulance/emergency rescue vehicle. His exterior has been massively retooled from the original Off Road version of this mold including a full roof over the rear of the vehicle and emergency lights on the roof. He’s got a nice clean Autobot logo on his otherwise empty hood as well as some clean paint and tampograph work down the sides of the vehicle. 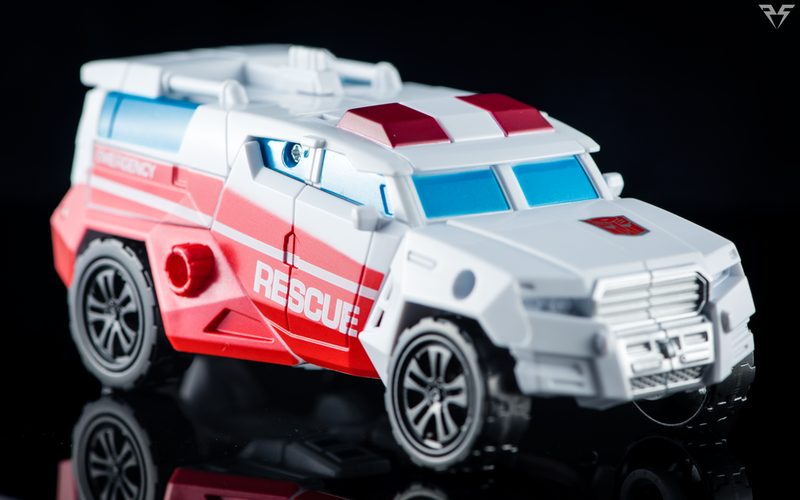 The white pinstripe and clean “Rescue” and "Emergency" indicators look really good and are a welcome difference from the mostly solid white you see when viewing him from the top. He looks very robust and capable of handling any terrain thrown at him in order to get where help is needed. 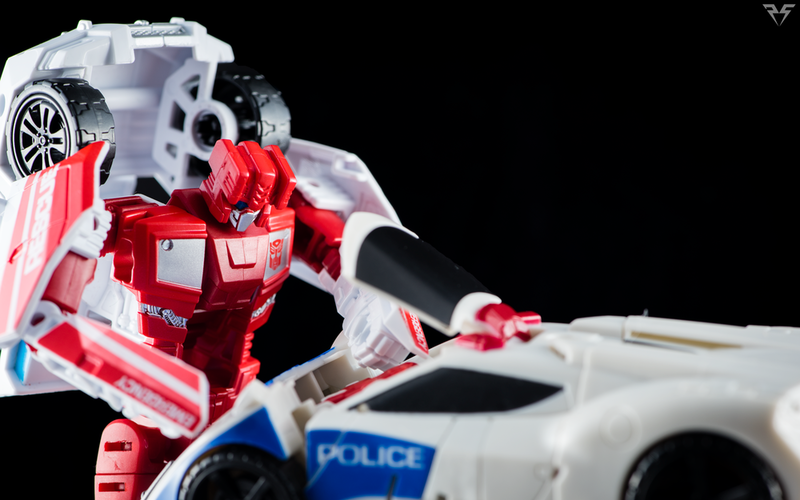 In robot mode First Aid undergoes a flip in color scheme as his mostly white vehicle mode gives way to a primarily red bot mode. He sports a brand new head sculpt with some nice paint work. The paint on his faceplate doesn’t fill the plastic perfectly but it’s more than adequate for a mainline release. His eyes are painted in a nice blue but sometimes shadows from his head crest can cause them to look a little dark. For posability he is functionally the same as Off Road with a nice range of movement. Ball jointed shoulders and hips, hinge elbows and knees and a ball jointed head allow for a good deal of posability and expression. 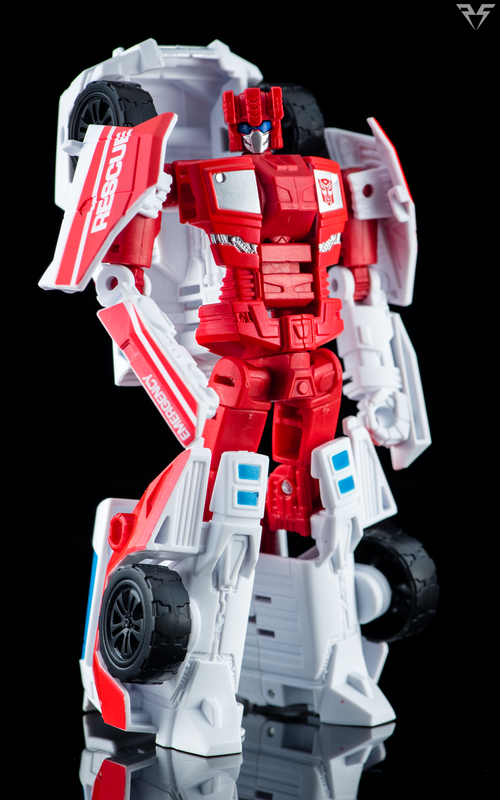 His combiner peg is the same red plastic his torso is made of, it blends in quite well even without a flap or cover. 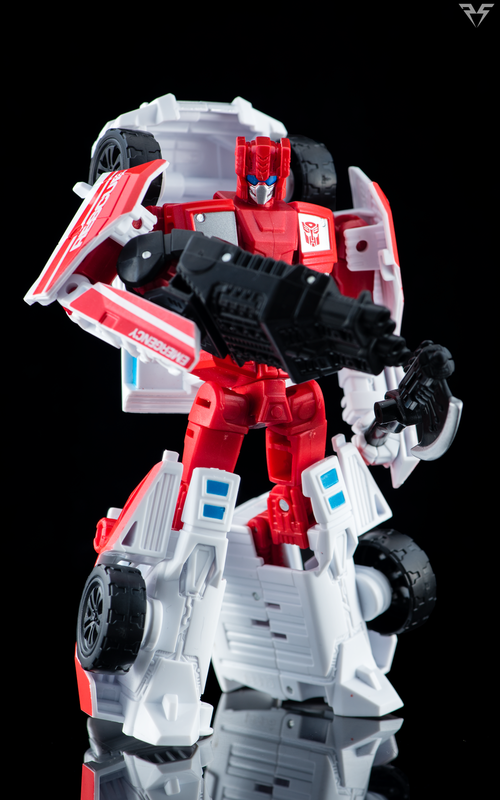 First Aid comes with the same 5mm Axe accessory and exhaust port style combiner weapon as Off Road (only in black).The combiner weapon and axe can be pegged in to his hands or the ports on his arms in bot mode, and can be mounted on the side rear fenders in vehicle mode. His combiner weapon can also tab in to his roof. While not an official storage spot you can slip the combiner weapon in behind his head in robot mode and it fits quite snuggly in the cavity created by the hood of the vehicle. This does look a little out of character on First Aid but it’s a nice storage area if you don’t want a PACIFIST MEDIC holding a giant gun. This storage method I found can also work on Off Road however the area in behind his head is not nearly as large and it is a very tight fit. Be careful not to stress the plastic around the wheel pegs. If it doesn’t fit nicely, don’t force it.